President Donald Trump will unveil the Missile Defense Review at the Pentagon. The Pentagon’s new Missile Defense Review highlights new space capabilities that could become the next layer of missile defense to deal with the threat of ballistic missile threats posed by North Korea and Iran. According to a senior administration official, the review looks at the development of new space-based sensors that could detect long-range missile before they are launched and calls for the study of whether lasers could be used to counter ballistic missiles that are launched by rogue states. President Donald Trump will visit the Pentagon on Thursday to formally unveil the Missile Defense Review. 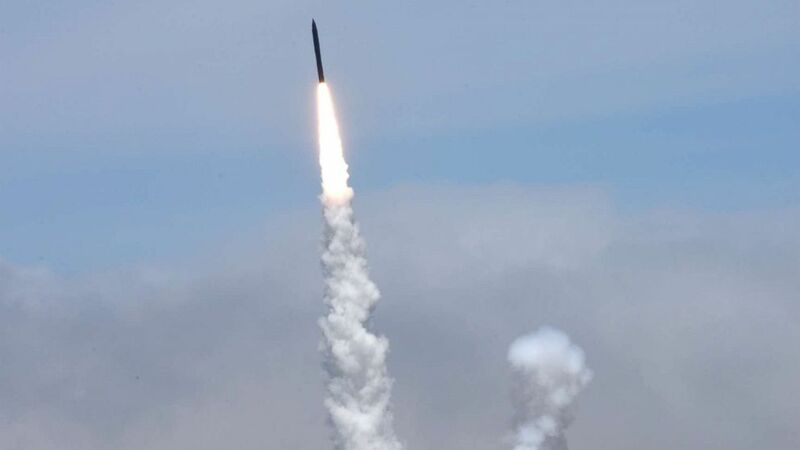 The first review of its kind to be undertaken since 2010, the Missile Defense Review provides a road ahead for how the United States could continue to counter the ballistic-missile threat to the United States and its regional allies and partners. (Missile Defense Agency) The U.S. Missile Defense Agency, in cooperation with the U.S. Air Force 30th Space Wing, the Joint Functional Component Command for Integrated Missile Defense and U.S. Northern Command, successfully intercepted an intercontinental ballistic missile target during a test of the Ground-based Midcourse Defense (GMD) element of the nation's ballistic missile defense system. But while the earlier review focused exclusively on the ballistic-missile threat, the new review broadens the scope to include cruise missile and hypersonic threats being developed by Russia and China. “Space is key to the next step of missile defense,” said the official. The current U.S. missile defense system consists of a layered approach of interceptor missile aboard Navy ships and long-range, ground-based interceptors based in Alaska and California. The Defense Department will looking at a space-based layer of sensors that could enhance early warning systems to track missiles before they are launched. ABC News has learned that another space technology that might be explored is the development of a space-based interceptor that could fire rockets into space, directed at an incoming missile. The Missile Defense Review also calls for the study of whether to use “directed energy” against incoming missiles, possibly through laser technology, according to the official. The official described it as an advanced capability “we think is worth looking into” and whether it makes sense to be able to deploy such a technology. ABC News has learned that one concept being explored for countering the North Korean missile threat in the future is using a new solid state powered laser on a high-altitude drone. The long-range laser would be able to destroy a North Korean missile while in the initial boost phase of its launch. The United States has 44 ground-based missile interceptors stationed at Fort Greeley in Alaska and Vandenberg Air Force Base in California designed to intercept North Korean missiles that might be headed towards the United States. The number of ground-based interceptors is already slated to increase to 64 in 2023. The official said the Missile Defense Review will continue studying the feasibility of creating a third such site elsewhere in the continental United States to counter a threat from Iranian long range missiles. The review is likely to rile Russia and China about America’s missile defense system, the official stressed that America’s missile defense systems are purely defensive and directed at a rogue threat. The official noted that the United States continues to rely on its nuclear arsenal to deter any potential Russian or Chinese nuclear attack.